Yeah well we shouldnt give this too much credit i think. That kills the mod. I feel really bad for him though, I know what it's like to desperately want to be at the top (I think most people here do). I think his problem was just that he felt like he deserved to be at the top and that his car was holding him back, so all someone had to do was give him a good car and he'd be fast. Betadood's 86 is on this very forum, Cursed Shark is still active here and could give advice, and Bukkaz hands his tune out to anyone that wants it, "it's my car" is not a good excuse to the people who had little to no help and still figured it out. We need a sticky with like big bold letters in the tuning section "YOU ARE NOT TAKUMI"
I would be Mako Sato, since I drive a 240sx as my main drift car (no proper 180 in FM4). Plus she is the only truly badass female character in Initial D anyway. i'm probably one of those people you see in the background watching the races or kenji. Its really sad, I hope other people here who are trying to get better can learn from this thread. When Mitch first started out on this forum, we offered to help, me personally and I know KraZe did also. After racing a few runs, he kept saying his tune didn't allow him to go fast and kept sliding to much. I told him 1. Not to worry about the tune and 2. Work on throttle control. Few more runs went on, he seemed to have taken at least a little of what I said, but kept bringing up tire wear and saying he was loosing grip. I told him it wasn't because it takes several trips down fujimi at a fast pace to start to wear the tires. I even took the tune in the 86 he said was making him slow and put a 4:38 in it on my first run. The tune wasn't the best, but it certainly wasn't the car slowing him down. I come to find out he asked someone a week later about helping him again, and talked about how I didn't really help him at all. I think KraZe also helped him before I did, and told him all the same stuff I did, yet he didn't learn anything. Another wanna be Takumi bites the dust. Can I be the guy who drives the Altezza, just so Avanti can't be him or maybe the Project D Support truck driver? Damn now I feel like a 43 year old asian man with no eyes. This was a bad idea. On the topic of Initial D characters I believe there was a place in the Initial D discussion thread where some of us mentioned which characters we better identified with. I honestly don't remember enough of ID to identify who I'd be closest to...Anyone wanna tell me? I think me and Burnie would be the Takahashi brothers and Kona would be Kenta, only like 3 people will get that joke but soooo worth it. Wow. Just wow. It went this far. I'm not very active. I'm not very fast. I'm not a pro tuner. I'm not a good painter. But you know something? I know how to take advice and instructions. 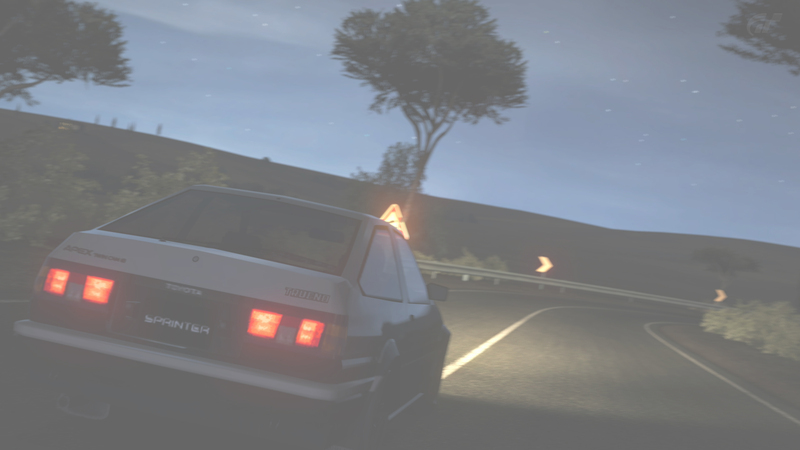 Hell, even a long time ago I posted my AW11 tune, and I did everything kraze told me to. You know what happened after that? I ran my best time. Sure, I've left the game since I moved to rFactor stuff, but I still remember my cheers of joy when I realized that I was wrong about the tune, like really, who sets the diff to 0 0? (I did.) And please don't blame your problems on autism, because the man who's words you're reading has a bit of the: https://youtu.be/DVNVzkWjEzs?t=45s Sure, family matters can be tough, but it is not okay to use it as a crutch for every time someone calls you out, or even corrects you. In my honest opinion, every word he wrote made that ban screenshot more and more satisfying. Can I be the "super ultra late braking" guy?